Rock climbers exert unique stress on their bodies both while training and during the focus of a redpoint. The effort behind these precision moves exposes athletes to the risk of injury in the pursuit of better climbing. For those who've made one move too many, esteemed German sports medicine doctors Dr. Volker Schoeff and Dr. Thomas Hochholzer provide an in-depth examination of common climbing injuries, treatments, and prevention. 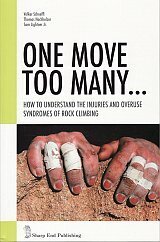 From the mildest case of belayers neck to a complete finger pulley rupture, get the information you need to avoid injury or to get back on the rock as soon as possible. This 2016 edition is greatly expanded and produced in full colour.